I finished. And all I can think about is doing it again! memory of the day. 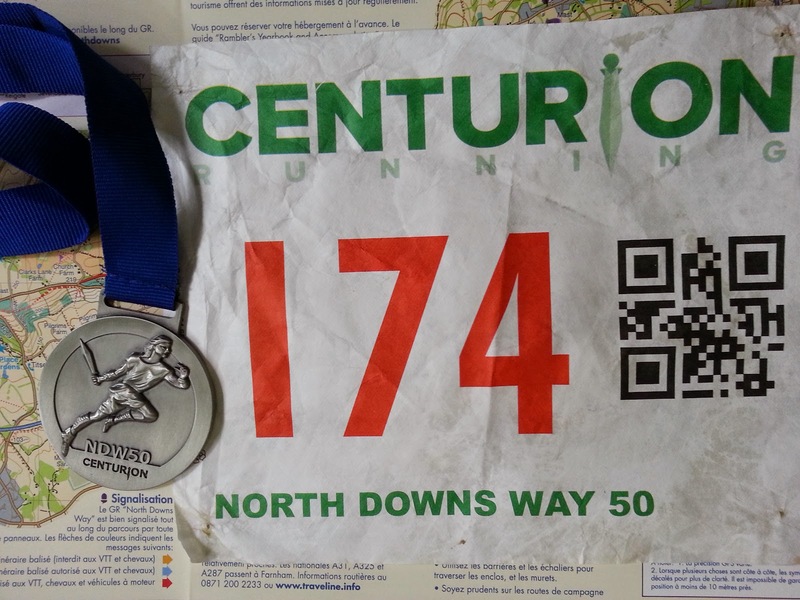 I remember the start and the finish clearly, but the 50 miles in between are a jumble of different snap shot memories. I don't know how some people seem to have HD recall but I might have to start taking notes on the way! 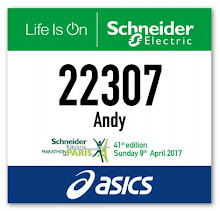 I registered for this race last October - it seemed like a good idea at the time and sufficiently distant not to create panic. Although I'd done a similar distance 2 years ago, it was flat laps. So I wasn't really sure how this was going to go but I had more than an inkling I was in for a long day. It was also forecast to be hot, so having been training all year in much cooler temperatures this was another unknown. The organisation was excellent and after a clear & to the point brief we were led down the road and around the corner to the start of the trail. I switched on my Garmin (310XT) and managed to get it into some sort of test mode which I couldn't escape from. So I had a bit off a faff while I googled on my phone how to soft reset it. I hoped it would be back up before the start. Not the best way to relax and enjoy the atmosphere. And before I knew it, at 8am, we were off. I waved to my dad who I wouldn't see again for a few hours and set off trying not to run too fast. I'd positioned myself near the back and was swept along with the throng down the narrow track - it felt a little bit too fast for 50 miles but comfortable for now. Before the end of the first mile I knew it was going to be a hot day as I had to wipe the first beads of sweat from my brow. The first mile passed in 10 minutes (splits below) and the miles flew by. It was a little congested as you'd expect at first with some nice little rests at the various gates. I just concentrated on trying not to go too fast and trying to find a rhythm which would work. After just over an hour we arrived at the first aid station at Puttenham where no crew was allowed. I took off my Salomon pack and gratefully received a top up of water into my bladder from one of the volunteers. 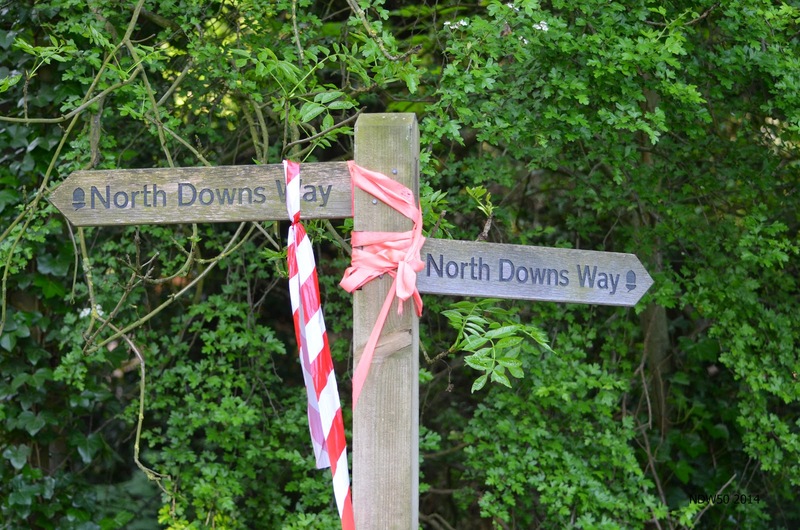 It would be another 8 miles to the next CP at Newlands Cross. Speaking of bladders, my other bladder was starting to quite urgently need attention. I stopped and during the course of an extremely long pee I idly wondered with the heat if & when I'd go again and what colour it would be by then! Onwards and after a while the first big climb up to the top of St Martha's Hill where I took in the first big view of the day, marveled at all the sand and took a selfie while I still had the energy. I think it was this section that the whole of the UKs DoE expeditions had come for the weekend. I passed countless small groups of teenagers carrying unfeasibly large rucksacks through the woods. Down the hill across a sort of meadow where I almost went the wrong way and up into the aid station at Newlands Cross, 15 miles. (If in doubt my default compass appears to point down hill.) Elapsed time about 2h15. My first rendezvous with my crew. I asked my Dad to top up my bladder and all of a sudden I felt ice cold water down my back. I shouted. Sorry he said, bit difficult to see at my height. He then poured another half litre down my back. Wow, that was cold! Turns out despite opening the bladder he was filling the thermal sleeve! Eventually I got topped up, grabbed a banana and squelched off trying to wring out my shorts. 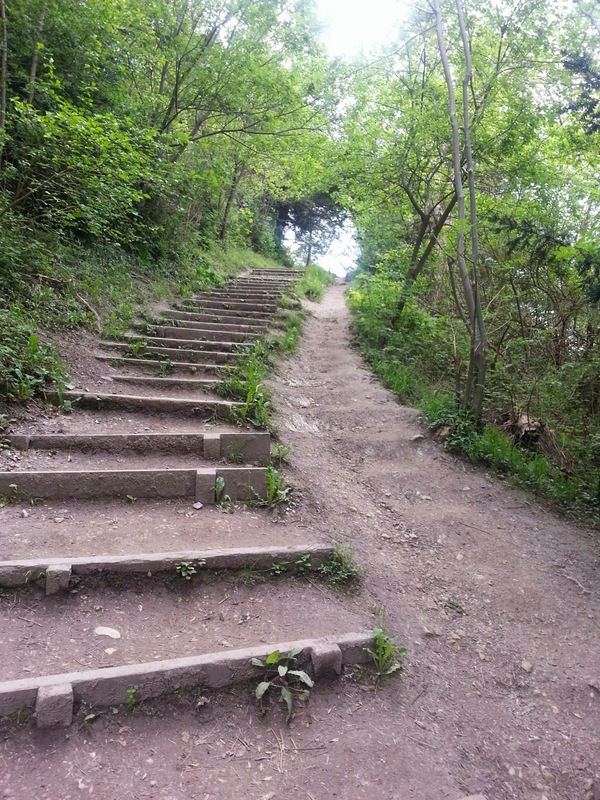 Now the next section of 9 miles or so up to Box Hill was undulating and very foresty. I remember that because I'm sitting in front of a map and can see my garmin trace. I do vaguely remember plenty of forest trail but nothing particularly stands out. I saw a few runners from time to time but it's amazing how you spread out - or at least how runners drop out of the sometimes limited line of sight. I was running on my own for most of the race. Although it was 9 miles to the next official CP, I'd arranged to meet Dad at Ranmore common which was about 22 miles. Next up came one the areas which did stick clearly in my mind. De​nb​ies vineyard. The big iron entrance gates, the lines of vines and the tourist train full of tourists. Yep, I had to run & squeeze down the side of the packed, stationary road train in the middle of the guides talk. He must have been used to it as he didn't break sentence. 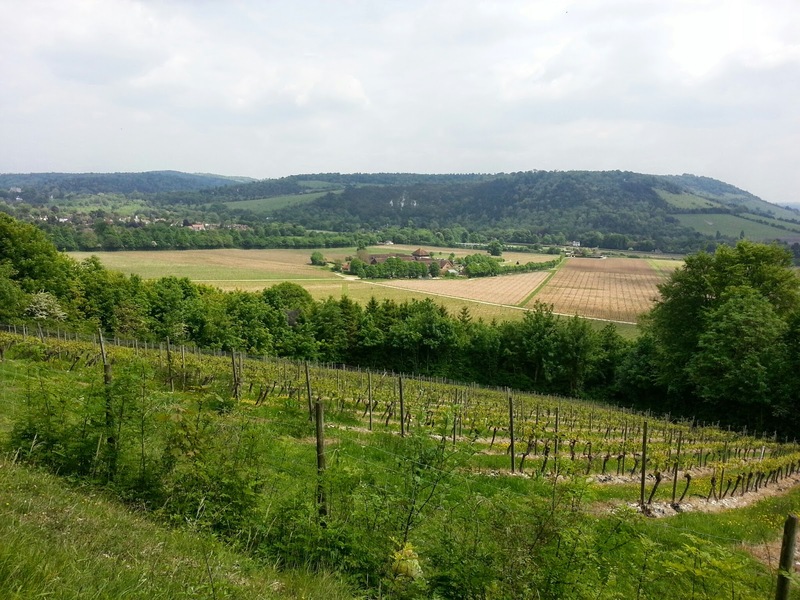 Also memorable here were the views - the steep slopes and neat rows of vines. I could have been running the Marathon du Beaujolais in my wifes hometown. 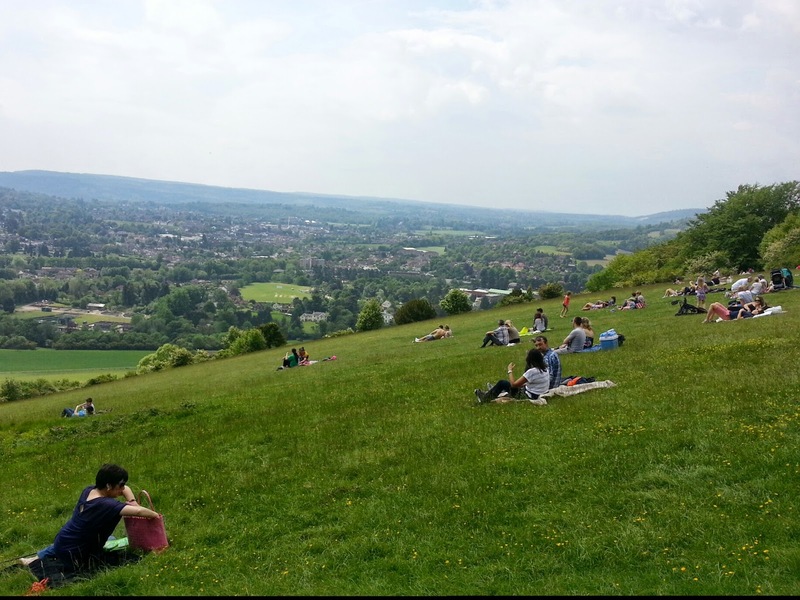 The only thing that spoilt the view were the alarming contours of box hill looming cliff like in the distance. I also remember running down the lovely shallow gradient of tarmac which seemed to last forever. I've noticed that hills make me grumpy and downhills have the opposite effect. So at this point I was feeling on top of the world and that I should really run 50 milers every weekend. 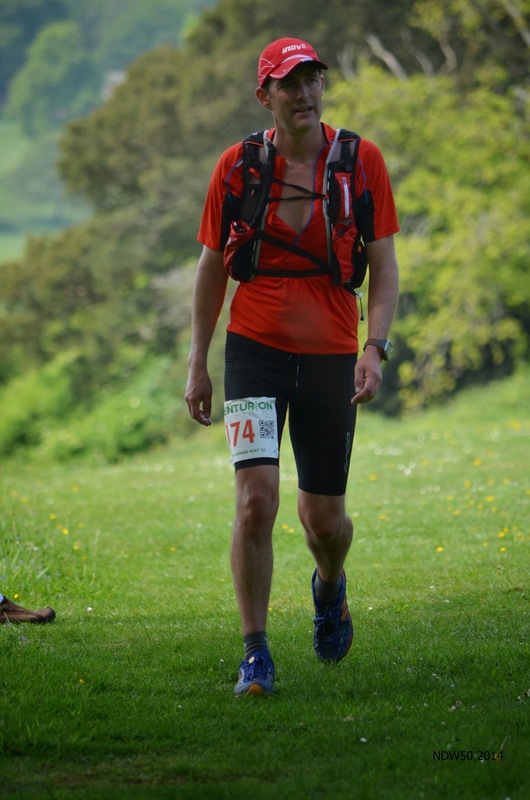 This state of euphoria lasted until the gradient flattened and I had to negotiate that annoying dog leg in full sight of the next aid station which takes you away from the aid station, under the busy A24 dual carriage way then back down the other side. 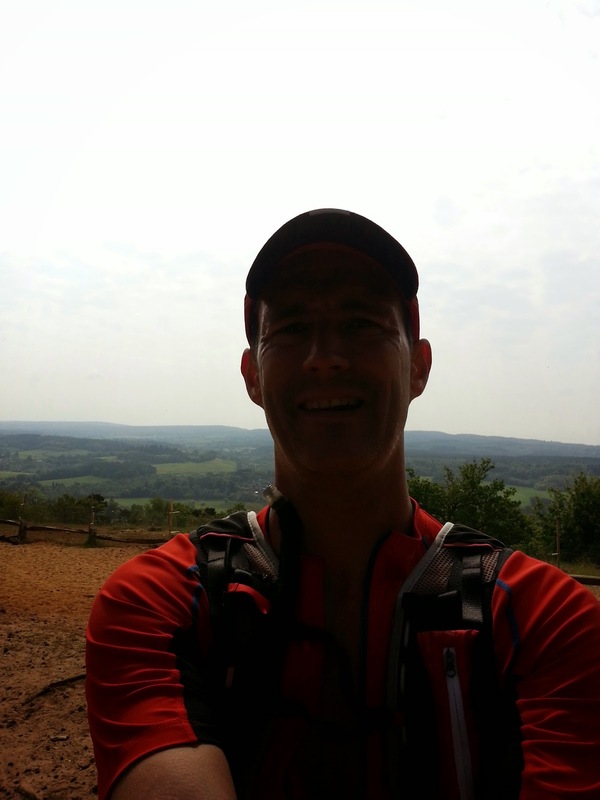 I arrived at the Box Hill CP after 4h45 and although I didn't know it at the time I was in 151st place (I didn't ask for obvious reasons!) I made sure to fill up with water and drank one or two of their cokes. Helpfully, or more rather disturbingly, the volunteers had drawn little warning triangles with the words 'steep climb ahead' on. One of them may have even had a cartoon of a man falling down a mountain, I can't quite remember. I knew box hill was a hill. But it's not box mountain. Is it? Not enough time to dwell and I headed off. One of the volunteers said that we were looking strong and could look forward to passing a few people over the next 27 miles. I replied that that would be a first! Next came the most memorable part of the run bar the finish. I defy anyone to tackle Box Hill and not remember it, much as like me they'd probably rather not. Steps. Lots of them. I don't know how many as I didn't count them. I'd have lost count anyway. They seemed to go on forever. It was around 1pm and I was really hot now - at times it almost felt like I was staggering. I didn't want to stop but when it didn't feel like I was staggering it felt like I was standing still. Once or twice my garmin agreed and beeped at me. At some point on the climb I passed another runner. Would be impressive except he was on his way back down for whatever reason. He wished me good luck. I wheezed. Finally I topped out and was surprised to see dozens of picnickers enjoying the sunny views. You can see from the photos that it wasn't quite a blue sky day - there was a high level haze to start which developed into fuller clouds later. Merciful as it meant there was little direct sun & sun burn was not a concern. It was warm though at around maybe 22C+ & humid. I caught up with my Dad again at Coombe lane around 27 miles. I can't really remember what I'd been eating when so far. But I'm pretty sure by now I was on the cola. So far I'd eaten a few bananas, a small flapjack and some jelly babies. 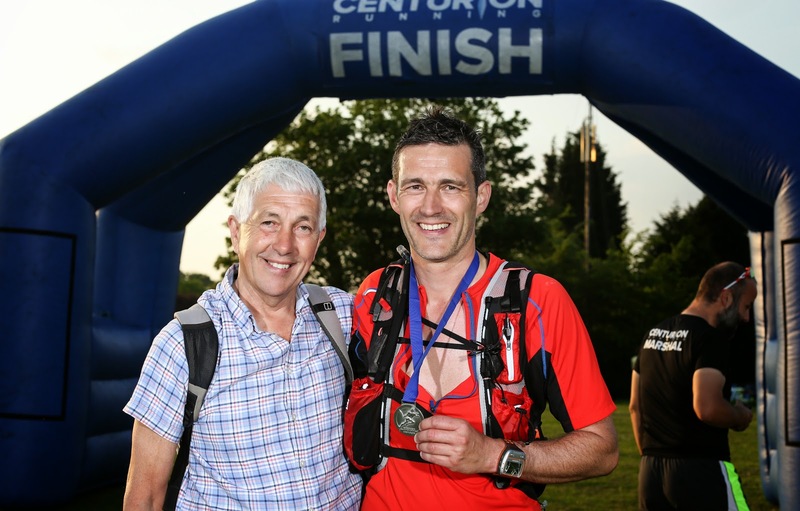 I caught up with my dad again at the official CP at Reigate Hill, 31 miles, memorable for the white bridge, but for me, not memorable for much else. Well except for my dad poring ice cold water down my back again. I don't think my mood was quite as resilient as the first time! I set off with very squelchy shorts again, wondering if it were possible to get trench arse. This last 10 mile section, not surprisingly, had the most elevation change of the race and was the slowest so far. I averaged 14:54/mile compared to 10:50 for the first 10 and 12:26 for the second. But my HR average was starting to come down presumably as I backed off the intensity and did more walking. Not long after we ran through a very large golf course and I caught up with my dad again near a church at 33/34 miles. After this quick stop, almost disaster! The route went along the pavement for about a km of a dead straight road. I was in the zone and in the distance ahead of me I could see another runner. Suddenly a shout. I looked behind to see 3 other runners crossing the road and disappearing. It could only mean one thing - I'd missed the turn. I waved at the runner ahead of me who'd also stopped and set off to retrace my steps, some 2-300 metres or so. I'm very grateful to the runner who shouted otherwise I have no idea how long I'd have carried on oblivious. These next 6 miles or so were the crappiest of them all. I can't remember why exactly, I don't know if it was the annoyance of the missed turn or everything just catching up. The miles seemed to go on forever and the garmin mile beeps seemed never to come. I remember thinking at some point that I should really just stick to marathons. Anything longer is just silly and quite unnecessary, it seemed, at the time. I had developed a little stomach ache, though I didn't feel sick. I wondered if I was hungry or had just had too much water. Hard to tell when you're in constant motion. I tried another S cap and after a while it went away - not sure if it was the S cap or what. I'd never had S caps before so it was a bit of a risk trying them in this race. I didn't take too many - I also had Zero tablets in my bladder and didn't want to overdo it - but I didn't seem to have any adverse affects. I don't know if they helped or not. But I did drink what seemed like loads of fluid and didn't end up feeling particularly bloated so something seemed to be working. 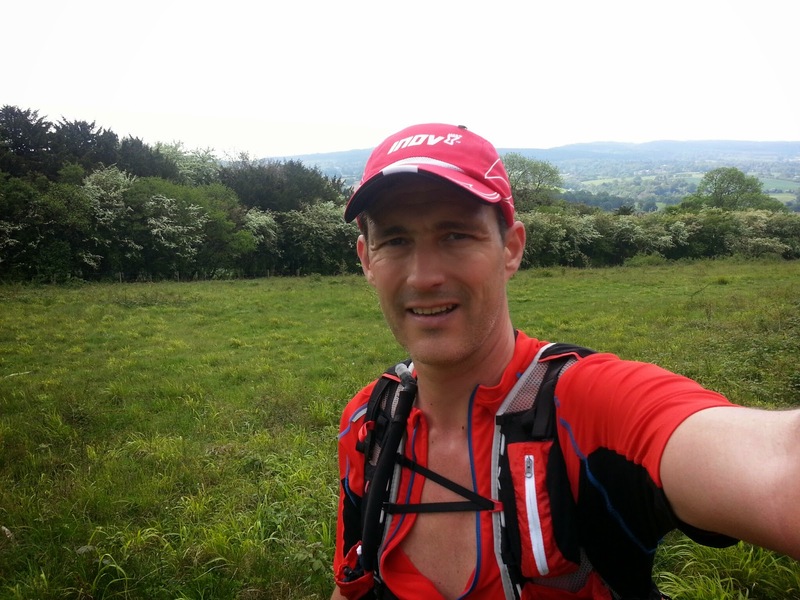 The next CP at Caterham (38 miles) was no crew allowed and I arrived after 8h35. Again I didn't know at the time but I was now 131st which meant I'd gained 20 places since the Box Hill CP. The volunteers there were right about making up places. Well almost right as I don't remember passing many people so perhaps they'd dropped out? I don't remember anything about this CP at all. Zero recall. Apologies to the no doubt wonderful volunteers but it's a blank. I caught up with my Dad a couple of miles later at Gangers Hill just after I'd run out of water. Which meant I can't have filled up at the aid station which was rather silly. I must have been out of it. Still a bit of water, another coke and I was on my way. By about mile 40 things were looking up. I was running quite a bit and I was feeling good. The last 10 miles I'd averaged 14:29/mile which looking back I don't think was too bad, despite how I'd felt at the time. Botley Hill came up and I remember slogging up another long hill, littered with signs about the tetley estate. Strangely I remember thinking I could really have done with a cuppa. Half way up this hill I had a bout of paranoia and turned back slightly to carefully inspect a crossroads for tape. There wasn't any. I think maybe my sub-conscious was really wishing that up was not the correct direction. 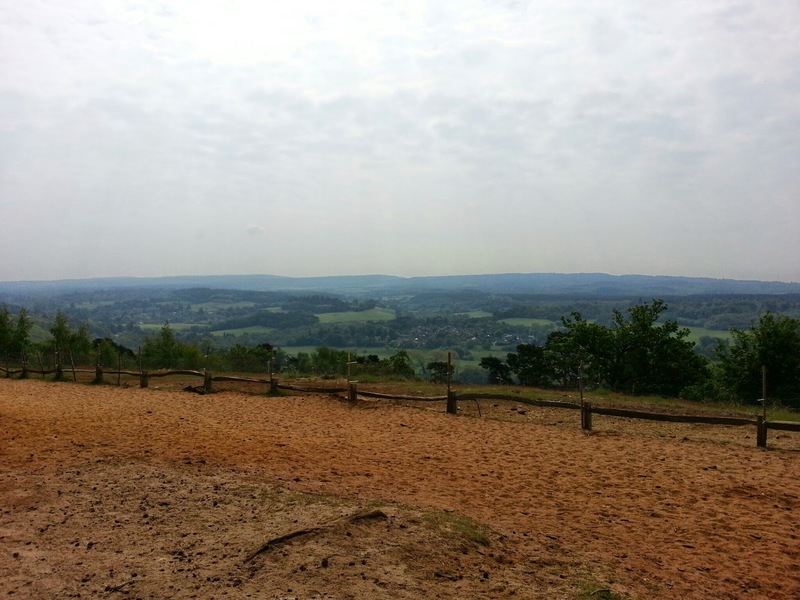 Turns out it was, and eventually I popped out to the Botley Hill CP at 43 miles. Here I had a revelation. Until now I'd picked up the odd nibble at the aid stations but being a bit fed up of my supplies I grazed the table, few crisps here, few nuts there and then.. a red grape! My god, what a grape. I'm not a massive fan of grapes day to day but this grape was made for me. It was cool, it was juicy, it was.. it was the most perfect grape ever. I had some more. I asked the lady if I could take some with me and stuffed a few in my pack and walked off chomping a few in my hand. Things were most definitely on the up. And then, unexpectedly around the corner I saw my dad. This CP was no crew, but he said he was driving to our next planned meet and spotted the flags so thought he'd stop just around he corner. This was another morale booster and with another coke in my hands I was off. One more meet planned with dad then it was the finish. 7 miles left, I started to think in terms of just another lunch time run to go. I'd been going for almost 10 hours now. A while back I'd been hoping that I might manage under 11 hours, but I knew the last 7 were going to take longer than an hour. But I was pretty sure they'd take less than 2 hours so I thought I was surely on for a sub 12. I decided to aim for sub 11.30. With renewed vigour I charged on. In this case, renewed vigour simply means moving forward at more than a walk. And charging, well, that was purely imaginary. In half an hour or so at around 46 miles I met my dad for the last time. I charged in (imaginary again) and told him this was going to be an F1 pitstop as I wanted to get on. (That bit's real..!) So with another coke I was off again. Though not before telling my dad I'd see him at the finish. "Nearly there!" I said and slapped him on the back. I was quite jolly. Pack straps off for a quick pit stop! We passed through fields. One had an impossibly steep gradient through cows and just as I thought I was going to expire, the path turned sharply right to follow along the contours. Later, ahead of me at the far corner of another field I could see a group of runners moving in different directions. Something was up. Then they started to come back towards me. I stopped as I realised they must have missed a turn somewhere and I didn't wish to waste energy until they found it. What I didn't realise as I stood there was that I was right next to it. 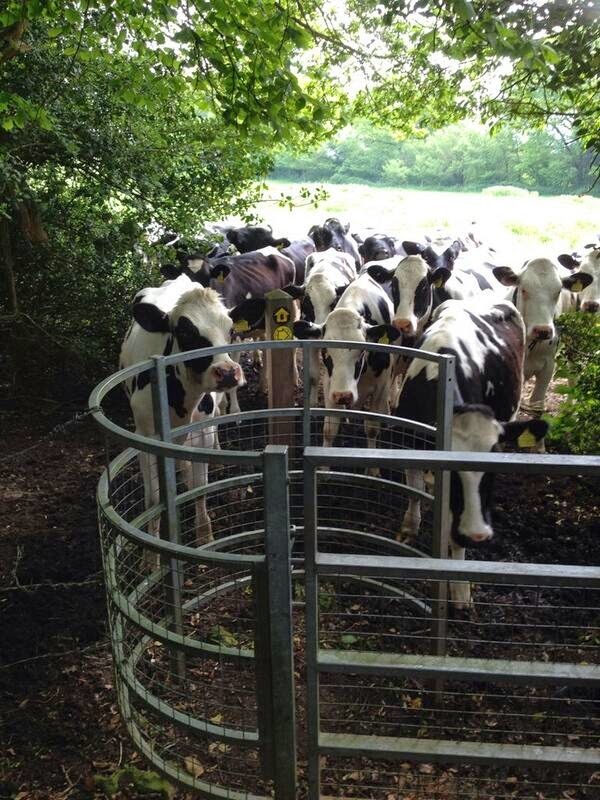 Problem was, there 20 cows obscuring not just the red & white marker tape but the whole metal gate in the hedge! I would have run right past too, oblivious to it if it were not for the others ahead of me. A lucky break. We shooed the cows out the way and passed through. This was not the last of the cows. We came across some frisky cows a bit further on. Some seemed to have horns and I was wearing red. To be honest, I was too tired to care too much. I recall idly wondering what my sprint capabilities might be and concluding it was best we didn't have to find out. We were now a group of 4 runners after the cowgate incident. Run walking as much as we could. Some of the path across the field here looked deceptively grassy smooth until you walked on it and found there were baked hard ruts from the cows footprints. I was fine on the flat but it was surprising how painful it was to have just the slightest twist put through my ankle. I hobbled quite a bit through these short sections. 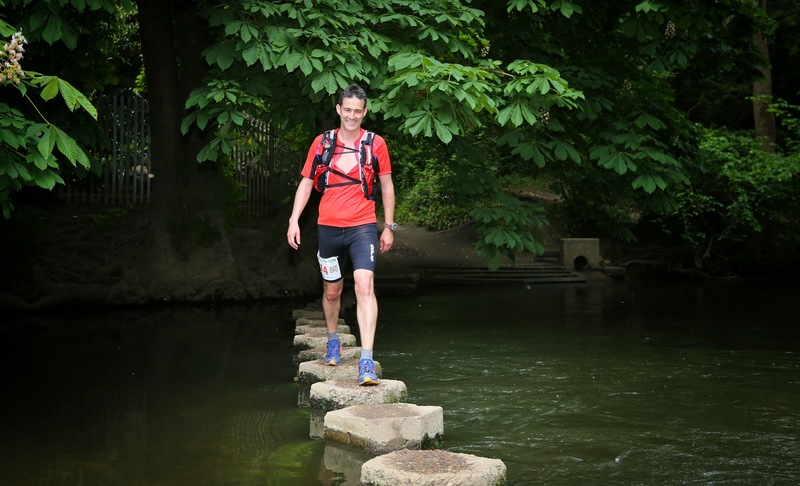 I worked out that we probably only had a few miles left and I was feeling strong. I decided I wanted to run. I still had 11h30 in mind though I knew even with my tired, dodgy maths that was not really achievable. I felt a bit rude breaking from the 'pack' but really too tired to worry too much. We were all racing our own race. I continued running, feeling pretty strong. After following the edge of fields for a while finally I saw the most glorious sight - a blue inflatable centurion finish line poking over a hedge across the other side of the field! This was a big lift. But there was one final twist. I could see a fallen tree ahead and could see the path go left as if to go straight towards the finish. But when I got there I found it just went left around the tree then followed the field, which now seemed enormous, straight on taking me further away from the finish. So I plodded on wondering if my dad could see me, crossed the field to a tarmac road then followed it around through the village. Left and up into a sports field, the finish in sight. Up hill! Well it felt up hill. It was glorious relief to know I'd finished. I was a bit befuddled, but happy. I let them take my number, give me a medal, take a photo and then another with my dad then it was time for one final can of coke. I arrived in 11h41 and had covered the final 10 miles at about 16min/mile pace. I did have the consolation of seeing my garmin beep through 50 miles in 11:27, but my official time was outside 11:30. Did I care? Not one bit. It's all arbitrary and I'm as happy now with my time as I was crossing the finish line. Doesn't mean I won't want to go quicker next time though! So those are my memories from that Saturday. They're a bit of a jumble but they are all of a very happy and enjoyable day. Thanks to all the organisers, volunteers and other runners which made it such a fantastic day. And of course my dad, who went completely way beyond what I expected of him in terms of crewing by reccing the route in advance on his way down. And for being exactly where I needed him on the route and helping to make the day such a success. Final time - 11h41. 134th out of 172 finishers. Turns out my garmin didn't quite boot up before the start and has some data marked 2007 at the front of the file. I managed to clean it enough to upload to garmin connect using this online tool /http://garmin.kiesewetter.nl/. However while I can access the splits, none of the graphs work.